Ghosts of a Revolution . . . Patrick Khumalo was only five when his entire village was massacred before his eyes. For twenty-nine years the desire for justice has burned inside him . . . but now it's lit a fuse. This book was provided to me in exchange for an honest review and I’m very glad I jumped on the change to get it. The book is listed as a thriller but I’m not sure it’s true in the traditional sense. If you’re looking for non-stop action and fight scenes this probably isn’t your book. In “The Lupane Legacy” the author builds intrigue throughout the book only to bring it to a crescendo near the end. What the author does really well is telling the story so thoroughly that it makes the reader feel as if they are actually there. He is able to describe the scenery and surroundings vividly without clichés. In addition he gives great background on the characters in a succinct way so that you know there history and what they’re thinking, without it being too long winded and boring. This really brings the story to life and is right up there with some of the best story telling out there. Mr. Heitsch does a great job will all of the accents and characters. His narration is well done and well timed which really helps bring the story and characters to life! 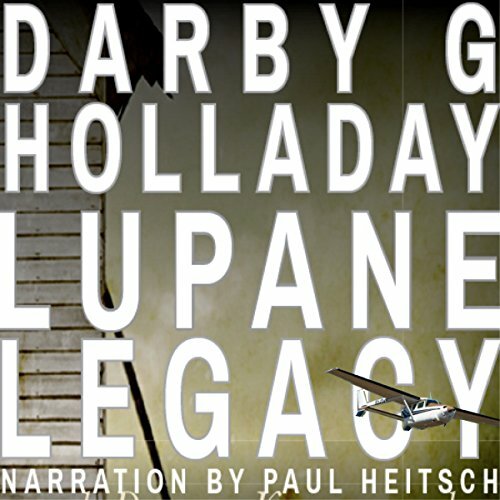 Would you consider the audio edition of The Lupane Legacy to be better than the print version? Yes, I think listening to the reader definitely improve the experience. Paul Heitsch has a great voice and the subtle nuances in his voice as he changes characters and locations really adds to the story. I think my most favorite character was Michael. He was so connected with his work and the people he worked with as well as the ones that worked for him. He had an intuitive sense about people and situations. Which character – as performed by Paul Heitsch – was your favorite? It is hard to pick one favorite. I was drawn to both Joshua and Devon although I have to say that for a man just entering the prime of his life he seems a little stogie. I guess I'd have to pick Devon for her courage and fortitude. I don't feel I had an extreme reaction, but the ending left me with a feeling of being unresolved. It starts out in Africa with a horrific event and at the end I felt it was over, but the brutality and savageness was never answered with any sort of justice. This is a definite read. I would not have chosen this book from it's blurb, but I'm glad I read it. When I wasn't reading it I was thinking about it. A well crafted story with characters that left you wanting to know more about them. The plot had enough twists and turns to keep you wondering and coming back for more. Lupane Legacy is an interesting thriller that maintains two story lines coming together seamlessly into one climatic experience. Beginning with Patrick, a Zimbabwean, who survived his village’s massacre when he was five. Patrick has grown up keeping his head down and his eyes open. Waiting for years, he finally has the key information to expose those that massacred his village and family. He does not hesitate to implement his plan to share that information. The second story line centers on Denham and Kerr who meet and fall in love. He is a former Marine born into a wealthy and established family; her, a member of a business focused intelligence agency hiding behind a banking career. Denham is sucked into the intrigue because of family and his money; Kerr because of her new found love and career. Throughout, intrigue and politics, as well as one man’s obsession blend the two story lines together to create an exciting thriller. As with any first book of a series there is a lot of “building” characters and history. This can get bogged down at times but overall, it was not too much. I found Kerr and Denham’s passion for one another a little lacking but as I said it takes time to build those relationships. It was interesting to see how far Patrick was willing to go to get revenge. It makes one wonder how far one would go to get revenge if in the same situation.There were threads within the story that called into question power vs corruption, revenge vs redemption along with relationship issues – work, love, truth and deception. Several twists made the story interesting and jaw dropping. Nothing in this story was simple – there were so many hidden things that took a little bit to reveal. It was well worth the wait. It was a complicated but a well-constructed story. The characters were well developed although I thought the conversation between Denham and Kerr towards the end was a bit tame. The narrator did an excellent job. He spoke clearly and kept his characters straight. His voice provided the correct amount of inflection for the emotion needed. Plus he has a pleasant voice. I had no issues with the production, it was well done! I recommend this audio book. A must read if you enjoy thrillers. Where does The Lupane Legacy rank among all the audiobooks you’ve listened to so far? This saga takes us over a long journey in several peoples intertwining lives and plays it out in an all too realistic to today's news manner. Has a strong romance angle that is very tastefully done. There were a few loose ends here and there technically as if the author did't really understand the gadgetry the character was using. Overall, a good read. What was one of the most memorable moments of The Lupane Legacy? Yes, when Desmond explained things to Constance. This book is memorable and thought provoking. Extremely brutal and violent massacre in Zimbabwe. Khumalo is the one and only survivor. As it goes on the story gets more and more involved with different locations and different characters as well. The Lupane Legacy is very well written and definitely a page turner. absolutely, this is a refreshingly different spy thriller story. This new to me author starts the story with an young boy witnessing the slaughter of his whole family in the Lupane District Zimbabwe. This is a fast paced thriller, travelleing back and forth through the continents, with a slight touch of romance too. I thoroughly enjoyed this audiobook . exciting plot and really good narration (Paul Heitsch) really brought the carachters to life . I'm glad to see that it's the start of a series .